SK850LC-10E - Kobelco to launch its largest excavator in Europe - Kobelco Construction Machinery Europe B.V. Following the recent and successful introduction of several heavy demolition machines in Europe, Kobelco Construction Machinery Europe B.V. (KCME) is preparing to launch its largest excavator yet. The Kobelco SK850LC-10E is the latest addition to the Japanese manufacturer’s proven Generation 10 range and will make its European debut at BAUMA on 8-15 April. Kobelco is well-known worldwide as a leading excavator specialist with more than 80 years of manufacturing and design experience. The manufacturer’s machines are particularly highly-regarded for their advanced technology and the SK850LC-10E is no exception. Driven by a powerful Hino engine, the new machine delivers superior strength and performance via an uprated specification of 2,120 Nm of torque and 380 kW of power. The SK850LC-10E also features Kobelco’s latest cooling system – a hydraulically-driven twin fan engine cooling system. This hydraulic version also prevents over-cooling by use of integrated sensors to reduce the speed of the twin-fan unit, helping to increase efficiency and reliability. In addition, technically advanced systems in the engine’s dynamics have been designed to further help reduce the machine’s carbon footprint and meet the new Stage V emissions regulations, which come into force later this year. The conventional SK850LC-10E, with standard boom and four arm variations, is best suited to general construction and excavation jobsites. However, extensive development and testing was undertaken in quarry conditions in China, India and a number of other South East Asian countries, also proving the machine’s hardworking and durability credentials. An ‘ME’ version of the SK850LC-10E, with short boom and short arm, is also available specifically for quarrying. A demolition (DLC) version is expected to launch in 2020. 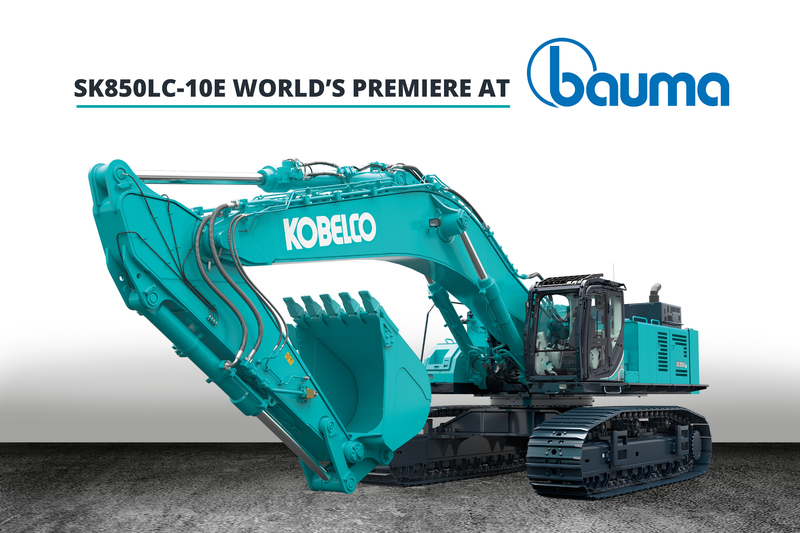 See the Kobelco SK850LC-10 on KCME’s outdoor stand FN1016 at BAUMA 2019.